This past weekend, for the third consecutive year, I had the pleasure of working with two groups of Tufts students through the Tufts FOCUS pre-orientation community service program. 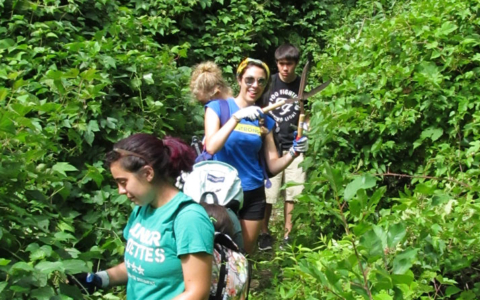 In a true win-win scenario, the Fells benefits from the work of these dedicated volunteer crews, while the students benefit by learning of a wonderful resource for outdoor recreation and contemplation located surprisingly near to their urban campus. 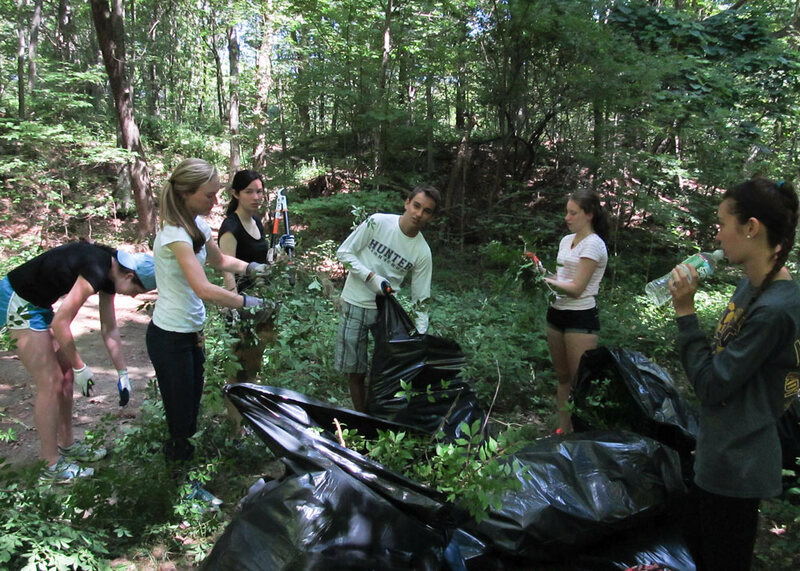 On Saturday, 11 students worked to clear the overgrown trail at Doleful Pond. While working, we watched a jogger enter the woods, only to turn back from the impassable section of trail, making the impact of this work immediately obvious. 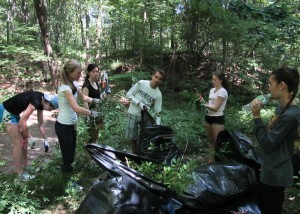 In addition to cutting back the branches and vines that had blocked the trail, the group carried out a large bag of trash and another large bag of recyclables which were taken by the students to be put into the recycling stream. Two hearty group members even managed to pull out a heavy old carpet that had been discarded by the side of the trail. 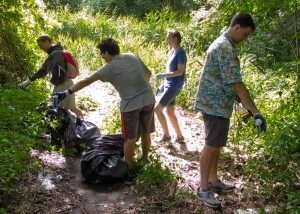 The group continued to clear and clean their way along the Crystal Spring Trail to Greenwood Park, and along Spot Pond to the Botume House. Finishing the day at Botume House created the opportunity for interested volunteers to enjoy the wonderful new interpretive displays on the geography, biology and cultural history of the properties that now comprise the Middlesex Fells Reservation. 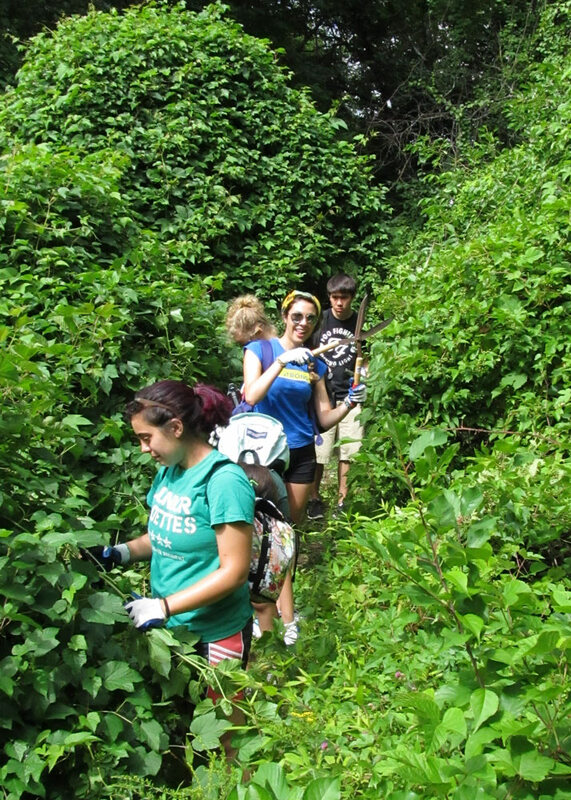 On Sunday the second group of 10 students joined me in clearing invasive Winged Euonymous (Burning Bush) from the Crystal Spring area and in Virginia Wood. Returning to this site for the third year with Tufts FOCUS, I was able to witness a real change in the landscape. Areas away from the water where the cut stumps had been chemically treated in past years saw almost no return of the invasive, while even the areas near the water saw native plants beginning to fill in where the invasive bushes had been cut back in prior years. The group finished work early and was in the right place at the right time to cap their day with a Ranger-led program discussing the industrial history of Virginia Wood. Two students were thrilled to discover the connection to Frederick Tudor (Boston’s “Ice King”), whose gravesite they had visited earlier this week at King’s Chapel Cemetery in Boston. 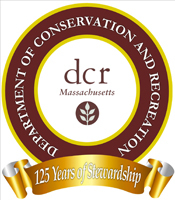 Looking ahead, National Public Lands Day is Saturday, September 27 and the Friends of the Fells will again be hosting several volunteer opportunities throughout the Reservation on that date, including several cleanups around Spot Pond in conjunction with Massachusetts COASTSWEEP. To learn more or to pre-register yourself or your group for that event, please email volunteer@fells.org.